Allow me to introduce myself - I am Patrick McDonagh, a marketing intern at FableVision Learning studying English Creative Writing at Endicott College. The gamut of work at FVL challenges my formal degree skills in a fun professional learning environment. Now at the end of my internship, it’s time to put the lessons I’ve learned into action. I have been challenged to create an easy-to-build Fab@School Maker Studio project for kids ages 5-11 for construction in a library setting. The result of this challenge, after many iterations, is a turkey mask designed in Fab@School Maker Studio and ready to debut at the Dedham Public Library. I will be honest, my first iteration of the mask did not resemble a turkey. I set out to work on my laptop early in a Peet’s Coffee tinkering with the software tools for hours trying to find shapes to form my vision. Coffee fueled my design, frustration, and perceived failure - my goal was perfection. 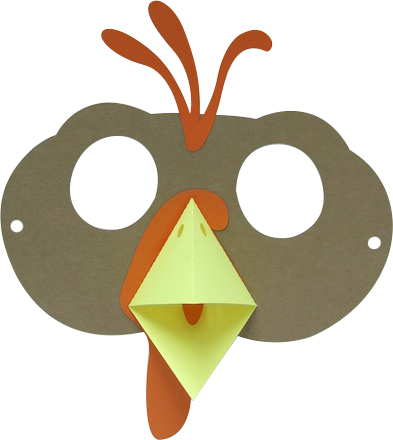 I used the oval shape tool for feathers, then dragged and manipulated shapes for the turkey's snood. I asked a neighbor what animal they thought I had made. The response was unflattering. I achieved a stylized and symmetrical 2D turkey shape by modifying Shapes with the Reflect, Align, and Weld features. Used the Ruler, Grid, and Magnetize tool to visually interpret dimensions and distance between objects and snap them together. Developed an understanding of each individual piece’s form and assembly across a project with multiple sheets of paper. I saved helpful design elements for later by positioning them on the outer edges of the edit area. Fabricated often and attempted assembly to refine project design across multiple iterations. The first test mask I fabricated measured five inches in width. Only after I fabricated a mask that barely covered my face did I know it needed resizing. Supplies for Fab@School Maker Studio are inexpensive enough that I was able to incorporate fabrication into my prototyping process. I realized it didn’t need to be perfect right away. I felt more at ease creating without the inhibiting goal of perfection, and instead shifted focus to simplifying the design. Each remaining shape needed a critical purpose. Project refinement is a productive exercise for students forming foundational knowledge of iterative design and fabrication with Fab@School Maker Studio. Transitioning from concept to a recognizable design was exciting. This is the final product. I am proud to share my mask in Fab@School Maker Studio as a 3D Ready-Made project for students, teachers, and makers to fabricate. Are you in the Dedham area? Join us on Thursday, Nov. 16, at 3:30 p.m. at 43 Church St. for a hands-on Fab@School workshop. Remember to #CreateBravely!